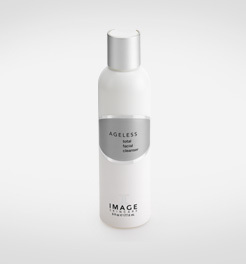 A universal foaming cleanser that rinses away makeup and oil, balances the pH of your skin and eliminates the need for a toner. A gentle glycolic acid blend begins the exfoliating process to reveal smoother skin. This revolutionary day and night serum rejuvenates your skin in a new dimension. The multi-layered technology of nutripeptides work synergistically to plump your skin while stem cell technology in an exclusive complex supports natural defense mechanisms and repairs cell damage. Dramatically reduces the appearance of fine lines due to facial expressions, wrinkles and other signs of aging. The unparalleled high concentration of effective ingredients will give you the Maximum benefit. · Prevention – Stem Cells. · Nutrition – Botanical Agents. Water (Aqua), The Max Complex™ (exclusive proprietary composition by Image Skincare), Sodium Hyaluronate, Acetyl Hexapeptide-8, and almitoyl,Pentapeptide-4, Hydrolyzed Rice Bran Protein, Glycine Soja (Soybean) Protein, Oxido Reductases, Hesperidin Methyl ChalconemSteareth-20, Dipeptide-2 Palmitoyl Tetrapeptide-7, Palmitoyl Tripeptide-5, Algae Extract, Pullulan, Palmitoyl Oligopeptide, Hydrolized Wheat Protein, Acetyl, Glutamyl Heptapeptide-1, Saccharide Isomerate, Centella Asiatica Extract, Echinacea Purpurea Extract, Spiraea Ulmaria Flower Extract, Camellia, Sinensis Leaf Extract, Plankton Extract, Arabidopsis Thaliana Extract, Glycerine, Polysorbate 20, Ethylhexylglycerin, PEG 8/SMDI Copolymer,Imperata Cylindrica Root Extract, Triethanolamine, Lecithin, Disodium EDTA, Potassium Sorbate. A unique cosmeceutical blend of alpha hydroxy acids in combination with apple stem cell technology; Protects skin cells against oxidative stress and combats the aging effects on the skin. An anti-oxidant blend hydrates for luminous, glowing skin. Immediate activity of product is Multi-hydroxy acid smoothes fine normal, this will subside lines. A glycolic/retinol anti-aging night repair crème that delivers vitamins and nutrients for visibly firmer skin. Works overnight to repair and resurface. New Technology. New Science. New Skin. The MAX crème™ is one of the first crèmes available in the marketplace today incorporating two Different strains of plant derived stem cells in one revolutionary formula to prevent and reverse the Signs of aging. Unmatched in the Maximum concentration of active ingredients, this crème repairs Cell damage, protects against free radical damage and recreates the extracellular matrix to maintain a Healthy structure of the skin. Aging skin, dehydrated skin, lines And wrinkles due to facial expressions, Compromised skin due to environmental Damage Sensitive skin Apply and massage into skin on face, neck and eye lids after Cleansing. Can be used every day for maximum benefits. expression (reversible) Modulates muscle contraction thus preventing the formation of lines and wrinkles that are caused by repeated movement A messenger peptide for collagen renewal, retinoic acid like activity without irritancy, in vitro collagen stimulation by 350% and stimulation of glycosaminoglycane synthesis by 146% A natural plant and marine based tightening complex that smoothes the skin and makes it more radiant-looking.